Glazes come in a wide variety of finishes, colors and temperature ranges to match the incredible versatility of working with clay. Though the formulas vary, all glazes are composed of a mixture of silica, fluxes and colorants. Fluxes raise and lower the melting point of silica, making the glaze temperature range controllable. An assortment of metal oxides, chosen for their final fired colors, are used as colorants. Colorants usually account for less than 5% of the glaze by weight. The general "Clean = Safe" studio hygiene rules listed on the first page of our Safety section will carry you a long way toward materials safety. Here are a few additional considerations. 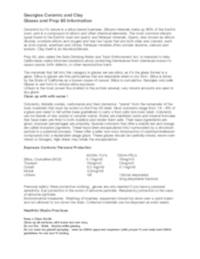 Commercially made glazes are required by law to list any handling precautions on their labels. The labels provide valuable information about handling and using the glaze. They'll say if the glaze is lead-free, nontoxic, food-safe, etc -- or they'll list special handling precautions that might be required. The labels will also tell you the firing range for which the glaze is intended; this will help make your projects successful. Working with wet premixed glazes also greatly reduces or eliminates the risk of dust inhalation. Dry glaze materials usually come in the form of very fine powders which are weighed, sorted, blended and mixed with water. Working with these materials can result in high rates of dust exposure. There are three main avenues of exposure to hazardous or toxic materials: absorption through the skin, inhalation by breathing dust, and ingestion by eating or drinking them. Of these three, inhalation is the fastest, easiest and most common method of exposure. This is why we at Georgies don't offer our glazes for sale in a dry form, and why we don't carry lead-bearing glaze ingredients. Wear at least a surgical dust mask and latex gloves when mixing dry glazes. If you work often with dry glazes, we recommend buying a dustproof respirator. We recommend that you make your work area lead-free right from the start. Until the 1980s, lead was used as a flux in many glaze formulas because it promoted bright, clear finishes and easy use. In the last 20 years, the US ceramic industry has moved steadily toward all lead-free formulas. There are a few leaded glazes remaining on the market. They should be regarded as toxic. Lead-bearing glazes cannot legally be used in any setting where children, the mentally handicapped or the developmentally disabled will come in contact with them. Pregnant women, nursing mothers and women considering pregnancy should avoid contact with lead-bearing glazes. In some areas, water used to clean up lead-bearing glazes is considered toxic waste, subject to regulation and special handling precautions. On the whole, it's easier -- and safer -- to avoid the hassles. Choose to be lead-free. Glazes that don't contain lead may still contain other metals that can pose health risks. Compounds of nickel, chrome, cobalt, antimony and manganese (among others) are used as glaze pigments, and they are known to cause health problems. The risk posed by these metals varies with the amount present, your amount of exposure, duration of exposure, and the vagaries of your body's defenses against them. 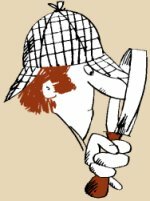 Our best advice to you is to ask questions: find out what is in the glazes you use. As a general practice, don't eat, drink or smoke while glazing your work. Wash your hands after glazing, and keep your work area clean and organized. 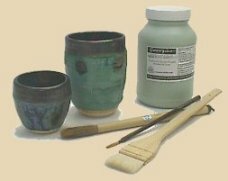 Glazes can be poured, dipped, brushed or sprayed onto your work. If you pour, dip or brush your glazes, promptly clean up any spills, drips or spatters before they have a chance to dry and become dust. Spraying a glaze, by definition, means creating and releasing a fine mist into the air. Specialized equipment like spray booths to catch the mist and personal protective devices like goggles and respirators are strongly recommended or required.